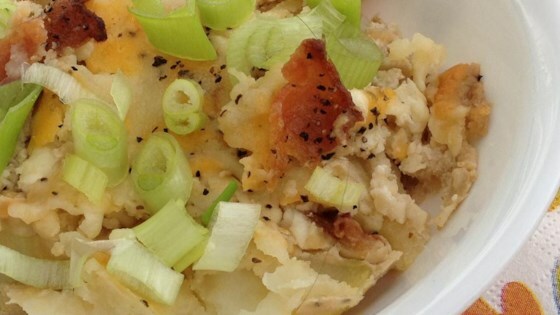 "A fun alternative to a 'twice baked' potato." Cook potatoes in the microwave until tender, 4 to 5 minutes. Cut into 1-inch cubes. Place bacon in a large skillet and cook over medium-high heat, turning occasionally, until evenly browned, about 10 minutes. Drain the bacon slices on paper towels; crumble. Arrange half the potatoes in the prepared baking dish; top with half the bacon, sour cream, mozzarella cheese, Cheddar cheese, salt, and black pepper. Repeat layering with remaining ingredients. Bake in the preheated oven until casserole is bubbling and cheese is melted, 20 to 25 minutes. Potatoes, bacon, cheese...need we say more? This recipe was easy to make and it was pretty tasty. If I make it again I will add more spices as I found it a bit bland for my taste.